Yasmin El Derby is the co-founder and festival director at the London Middle East and North Africa Film Festival which takes place each autumn. Showcasing new films from the region, the Festival aims to open up cross-cultural dialogue and understanding. Below Yasmin El Derby talks to Martin Evans about the place of the Pontecorvo film within the history of North African and Middle Eastern cinema. She also discusses the broader issues of film making in the region which the London Festival is bringing to British audiences. Martin Evans: What impact has Pontecorvo’s film had upon film making in the North Africa and the Middle East since its release in 1966? Anyone who has been following the revolutions and developments within the Middle East and North Africa region will know that this quote is ringing true all over – ousting dictators is just the beginning, and film as an art form is situated perfectly to convey messages and also ideologies to the masses. The landscape of filmmaking in the MENA (Middle East and North Africa) region has been morphing and developing since the dawn of the moving image. In the early twentieth century, when Europe was dipping its cinematic toe in the water, so were the upper classes of Egypt. The width and breadth of filmmaking styles within the region is huge – it’s just that Europe, in particular the UK, rarely gets an opportunity to see many of these films. Algerian cinema has been hugely influenced by the war of independence (1954 – 1962) and nationalism as a topic has been explored many times in Algerian films since Pontecorvo’s masterpiece. Nationalism has more recently been explored across the whole region. A recent documentary by the French documentary maker Laurene Lepytre Jesus, Mary, Allah and The Others (2012, France) discusses the ideas of nationalism in post-revolution Egypt – where many citizens are adamant that first and foremost, “we are all Egyptians, regardless of religion”. Nationality and country comes first, the rest is secondary. 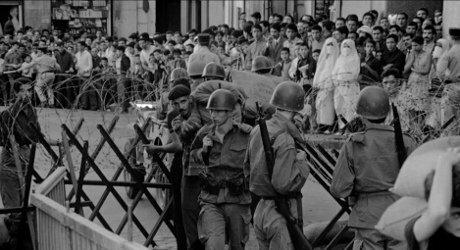 A recent film that could be compared in both theme and style to The Battle of Algiers, is the recent feature by Egyptian Ibrahim El Batout’s Winter of Discontent (2012, Egypt). A story told against the backdrop of the Egyptian revolution. Production of El Batout’s second feature was actually under way by February 10, 2011 – just one day before President Hosni Mubarak was ousted after 30 years in power, meaning that a lot of the footage in the film is actually real – giving the film a raw and authentic feel. Similar to The Battle of Algiers, and given the speed at which both films were produced from the time of the uprisings they are focusing on (Algeria had only been independent for 4 years when Pontecorvo’s film was made) it is sometimes hard to distinguish what is ‘real’ and what is acted. In fact, it was probably hard to distinguish for the actors themselves, and El Batout has revealed that a scene in which his real-life brother is talking about torture at the hands of the security forces was not strictly fictitious. Martin Evans: Why does the film continue to be a reference point for North African and Middle East film makers? 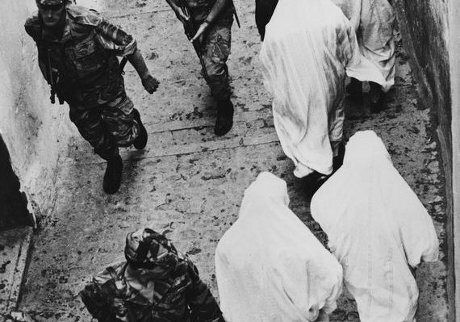 Yasmin El Derby: Gillo Pontecorvo’s The Battle of Algiers continues to be a point of reference in all spheres of cinema – not just within the Middle East and North Africa, even in Quentin Tarantino’s 2009 film Inglorious Bastards (2009, USA / Germany), for example. Political leaders, occupiers and activists alike have referenced the film numerous times. The film was banned in Israel until 1988, when it finally had a run of screenings during the first intifada (Palestinian uprising against the occupation lasting between 1987 – 1993). The film was also screened at The Pentagon in Washington in 2003 as a basis for discussing strategies being used in the Iraq invasion. The film shall no doubt continue to be an important example of ‘revolutionary cinema’. Although many people have praised the film’s objectivity and ‘fairness’ in representing the atrocities carried out by both sides, more than this it seems to fit into theories of third cinema (a term coined by Argentinean filmmakers Fernando Solanas and Octavio Getino in the 1960s in their work ‘Towards a Third Cinema’ – which discussed Hollywood film as ‘First Cinema’ - purely a vehicle for making money and pushing bourgeois ideals. ‘Second Cinema’ as European art house cinema, concentrating on the individual artistic values of the auteur, and ‘Third Cinema’ as a collective art form, expressing revolutionary ideals). The style of the film, brilliantly executed by cinematographer Marcello Gatti almost mimicked a news / documentary visual style. Similar to Koutabiba Al Janabi’s Leaving Baghdad (2010, Iraq, UK, UAE, Hungary) – which went so far as to mix real documentary footage with fiction to create a fascinating and realistic feeling. Links can be made between Pontecorvo’s film and the recent surge of revolution-based cinema of the last two years: either way, the film is a must-see for any filmmaker, film buff or film studies student and for that reason will continue to be used as a reference point – intentionally or otherwise. Martin Evans: What is the state of film making across North Africa and the Middle East now? Yamin El Derby: There is so much change within the Middle East and North African region – both politically and culturally and this is having a huge impact on cinema. Not just in terms of themes, of course, like anywhere where films are picking up on the current social and political issues, but also in terms of production and what type of films are being produced. Take Egypt as an example, pre-revolution, 80% of all releases within the country were that of local productions, traditionally comedies, that not only packed cinemas in Egypt but also across the whole Arab world. A bigger tax was placed on foreign films and strict rules on how many could screen at any one time throughout Egypt. This meant that, like the days of the British ‘Ealing Comedies’ – a huge number of ‘light entertainment’ type films were churned out. But the types of films that were being released just before the revolutions kicked off across the whole region had already started to change in tone. Many had overtones of hopelessness and despair. Surprisingly, across the region, filmmaking did not cease because of the revolutions. In fact, in some instances it clearly pushed their creativity forward. Not only in the sense that the tone of the films was already beginning to be different, but also, suddenly, there was an international spotlight on film from the region. You only have to look at global film festival programmers to see that in 2011 and 2012 films from the Middle East and North Africa dominated many festivals worldwide. Filmmaking in the Middle East and North African region currently is in a very exciting phase. The future of cinema is certainly bright. Cinema from the region is securing a huge following from all around the world – thanks to our globalised web-linked world where a girl in Russia or Australia can find out about a film being made in UAE or Morocco at the touch of a button. I am in no doubt that the film industry in the region can only grow, and distribution will establish a further and further reach. Meanwhile, the traditional status quo of Egypt being the leaders in cinema production is being challenged. Egypt are still huge producers of film and some absolutely brilliant cinema is still coming out of the country, but countries like Jordan are also becoming big players, and with the creation of organizations such as the Doha Film Institute in Qatar there has been a huge surge of films being made within the UAE. Martin Evans: In your view who are the key contemporary film makers in North Africa and the Middle East? How are they reflecting the huge changes taking place across the region? Yasmin El Derby: There are so many filmmakers creating such inspiring work at the moment. Many contemporary filmmakers are reflecting the huge changes taking place not only through the themes that they are tackling, but also in the visual styles they are choosing to embrace. International film festivals selecting and screening a lot more films from the region, are giving a world audience to filmmakers such as Nadine Labaki, in her recent second feature Where Do We Go Now? (2012, Lebanon, France, Egypt, Italy) - a deeply touching and humorous story of Muslim and Christian women in a Lebanese village, that manages to tackle the highly sensitive topic of religious sectarianism; Saudi filmmaker Haifa Al-Mansour, who recently had her first feature Wadjda (2012, Saudi Arabia, Germany) screened at the London Film Festival, sparking an interest in the development of Saudi filmmaking (a country that does not host any cinema theatres) and the ongoing conversation about women’s issues; and Egyptian-born director Hesham Issawi, whose recent feature Cairo Exit (2010, Egypt), is a gritty drama reflecting the realities for many people in pre-revolution Cairo. This has still not been screened in Egypt – but has had substantial screenings at festivals across Europe and the USA. Issawi completed the film in December 2010 – just one month before the revolution began Egypt’s hopeful transition from dictatorship to democracy. Issawi later commented that if he had completed the film later – the whole tone would have been a lot more hopeful. Some other notable contemporary Egyptian filmmakers subverting the status quo are Amr Salama and Mohamed Diab. Salama directed the stunning Asmaa (2011, Egypt) a film inspired by true events about a young women in Egypt who is HIV Positive. He also co-directed the documentary Tahrir: The Good, The Bad and The Politician (2011, Egypt) – both films screened at the London Film Festival. Mohamed Diab directed the recent Cairo 678 (2010, Egypt) a film following the stories of three women in Egypt who deal with the daily plight of sexual harassment. The 2012 film After The Battle directed by Yousry Nasrallah is again a direct representation of the revolution that has swept across Egypt. Moroccan cinema is also reaching new highs of production numbers. A recent must-see is the 2010 film Majid (2010, Morocco) by Nassim Abassi. A tale, which follows the lives of an orphan and a street kid as they set off on a journey, which takes them from Mohammedia to Casablanca. Nassim Abassi studied film in the UK so Majid is a polished feature made with the high production values which European audiences are used to, but it remains a quintessentially Moroccan story. There are so many films and filmmakers one could mention, this is just the tip of the iceberg! Martin Evans: What is the aim of the Middle East and North African Film Festival in London? Yasmin El Derby: The idea for setting up the London MENA Film Festival came from a personal obsession with film in general and an observation that there was an extreme lack of representation of films from the MENA region here in the UK. I found this strange as there is such a huge diaspora in the UK and the film industry in the MENA region is so extensive. I came to the conclusion that, not only are there many British Arabs (including people of mixed heritage) who would be interested to see films from the region but also that there is a lot of interest in the region from the general British public – especially now with the current revolutions and uprisings across the Arab world (although the beginnings of the festival were already in motion by the time the first spark of revolution was lit). The festival aims to give Arab filmmakers a platform to express their creativity and also to give everyone an opportunity to access these films. Creating an environment of cultural exchange and being able to connect people – especially the diaspora to each other here in the UK (as well as to people back in the ‘home’ countries) was of paramount importance to us. We also really wanted to break down stereotypes surrounding the MENA region that are often reinforced in western media. There has definitely been a growth in interest in Middle East and North African cinema. I think there are a number of reasons for this; the emergence of so many film festivals in the MENA region and the growth of ‘new’ filmmaking in the UAE has contributed to this interest, and the recent revolutions and uprisings have had a huge impact – meaning people who never even thought about the region before have a sudden interest. Another contributing factor, in my view, is the current and prevalent media coverage of Arab countries – especially in recent years. Although a lot of this media coverage has been negative, I think it has sparked an interest for many people to discover more about the region, the people and culture. It is of paramount importance to display Middle East and North African cinema in the UK, simply because of the huge benefit in offering people an alternative to Hollywood cinema – just to show a different representation of the world and a different world-view. I also think there is a huge want for many British Arabs, especially second generation (myself included) to connect with their heritage and feel ‘part’ of it. A big objective of the festival is also to create a platform that can dispel some prevalent stereotypes and myths and bring people together in a positive integrated fashion – and what better way than through film – a totally accessible medium that if executed properly can cross all the boundaries of language, culture and ideology. We want to feed the appetite of everyone who has an interest in MENA culture – and even people who do not, but who might be tempted to come and see a film because quite simply, they like films. I feel films play an invaluable role in free expression not just in the Middle East and North Africa region but also throughout the globe. Serious issues can be hinted at through storytelling and filmmakers may feel they have more freedom expressing their views this way – under a safety net of a fictional story. With ever easier and cheaper ways to shoot films I think many people will be inspired to get their voices heard. Films can also have worldwide views (unlike some other forms of media) – meaning that a particular point can be made with the world in mind - a film can transcend cultural, language and ideology barriers and bring people together - building bridges along the way.